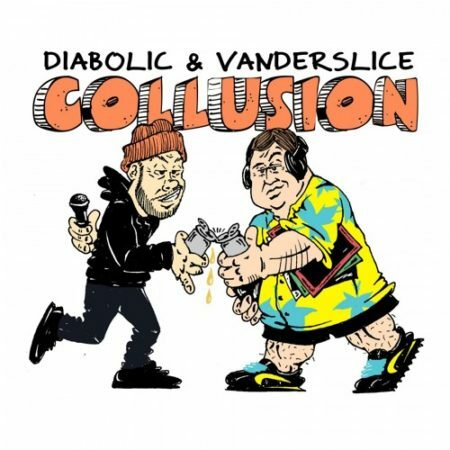 Since the early aughts, rapper Diabolic and producer Vanderslice have moved in similar circles, so it was only a matter of time that they would join forces for a collaborative record. With the release of ‘Collusion,’ that time is now, and it couldn’t have arrived at a more perfect moment. The project eschews every trend and flash-in-the-pan style to create a record that’s a must-listen for anyone who truly appreciates sharp lyricism and neck snapping production. It’s apparent that ‘Collusion’ is an absolute force when you hear opening track “Think of That,” a blistering banger featuring shots at his rivals, over Slice’s hypnotic production. And the remainder of the album hits just as hard, with tracks like the chest-thumping “Normalize,” the Nems featured heater, “See the Light,” the DJ Revolution-assisted “Simon Phoenix,” and the B-Side opener, “The Other Side,” which Vanderslice claims to be one of his toughest beats in years. In addition to battle-ready bars and neck-breaking production, the lyrics and album title of course reference the nation’s current political climate. But the thing is, that wasn’t intentional for either collaborator. “The ‘political’ topics I touch on are just hints of what’s on my mind at the time” Diabolic explains. Adding to that, Vanderslice states: “You let the artist write and record whatever they want. It’s my job to trim the fat and present it in it’s absolute best light.” With the fat trimmed and everything in place, we’re left with one of the most noteworthy rapper-producer collaborations of the year. ‘Collusion’ is available now for pre-order in both digital and CD formats, and becomes available on Friday, April 12. The LP is set to drop on two vinyl configurations as an official Record Store Day title through participating RSD outlets on April 13. Cassettes will also be available following the initial release, equipped with the instrumental passes. Be sure to check out our various album-themed merchandise which we’ll be updating to Bandcamp regularly.